Here’s a photo of a wall mural being installed. In this case, at Asheville House, a furniture maker in North Carolina. 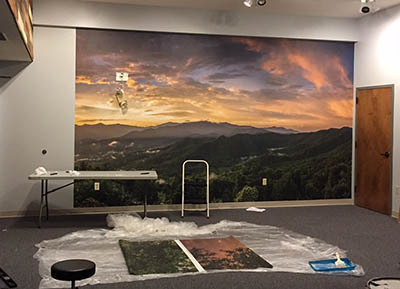 They were putting the wall mural in their conference room, it’s a photo of the beautiful mountains in their area. They are doing a couple of things right. First of all, they lay everything out before beginning the installation, just as we do before we ship it. That makes sure that, first of all, they have everything and secondly that they are installing the panels in the right order. We give you a diagram of how it should go, but still, it’s best to verify before you get into it. Secondly, they cleared the decks to give themselves some space to install the wall mural. You don’t want to be working around desks and chairs! Lastly, they have a table for applying paste and a step ladder to get to the ceiling easily. Done! This entry was posted in Custom Printed Wallpaper and tagged custom wall murals, installing wall mural, wallpaper installation. Bookmark the permalink.